R Eltringham. Field Trial of the Glostavent Anaesthetic Machine: DfID Project No. 1888; DfID/WFSA Partnership Scheme. The Internet Journal of Health. 2005 Volume 5 Number 1. We report a field trial of an aesthesia machine which can function in remote unequipped areas to the satisfaction of operator and safety of the patient. 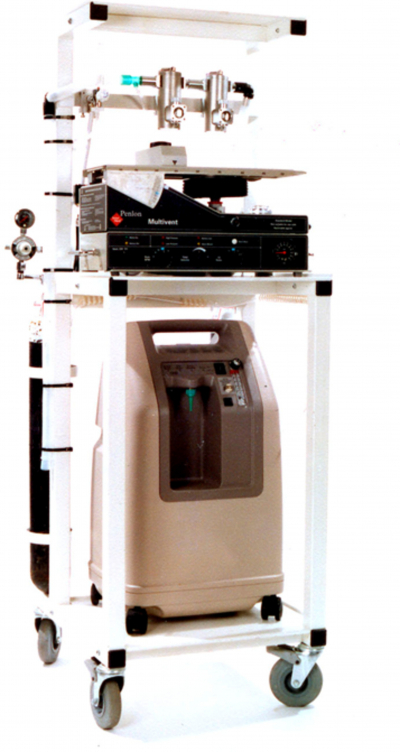 The Glostavent was first introduced in 1996 as a versatile anaesthetic machine, capable of functioning in the difficult environments encountered by anaesthetists working in the developing world. These difficulties include sudden interruption in the supplies of electricity or oxygen and poor facilities for the servicing and maintenance of anaesthetic equipment, conditions render the use of more sophisticated machines impractical. The Glostavent combines a draw-over anaesthetic circuit, a gas driven ventilator and an oxygen concentrator. It can continue to function without interruption if either oxygen or electricity fail. This project is undertaken by WFSA and Duch government sponsorship and this report is not a commercial advert. 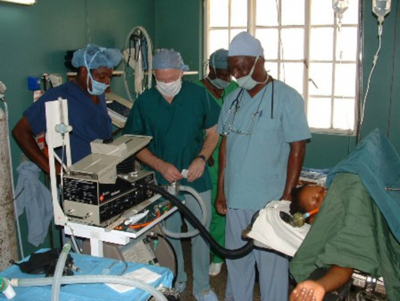 The Glostavent was first introduced in 1996 as a versatile anaesthetic machine, capable of functioning in the difficult environments encountered by anaesthetists working in the developing world. These difficulties include sudden interruption in the supplies of electricity or oxygen and poor facilities for the servicing and maintenance of anaesthetic equipment, conditions render the use of more sophisticated machines impractical. The Glostavent combines a draw-over anaesthetic circuit, a gas driven ventilator and an oxygen concentrator. It can continue to function without interruption if either oxygen or electricity fail. Its performance has been thoroughly appraised in the environment of a modern British hospital (Update in Anaesthesia 2003 No. 16 p31-35). The DfID/WFSA project was designed to enable the performance of the Glostavent to be assessed in the extreme conditions prevailing in much of the developing world. The project was initiated in 1999. 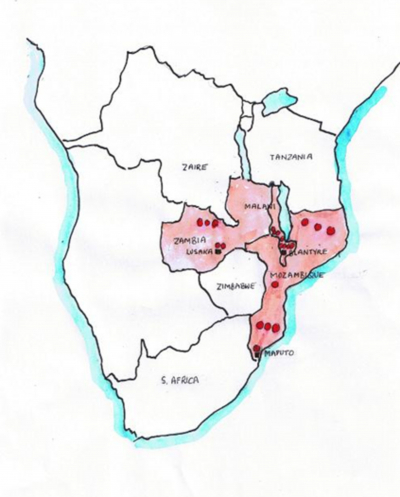 21 Glostavents were distributed around 3 countries in sub-Saharan Africa; Mozambique, Malawi and Zambia, for a field trial in order to provide the wide variety of conditions necessary for a thorough assessment to be undertaken. Malawi	- Professor Anneke Meursing and Mr Cyril Goddia (Queen Elizabeth Hospital, Blantyre). To select hospitals for the field trials of the Glostavents. To arrange training for the anaesthetists in the use of the Glostavents. To select technicians for instruction in the servicing and maintenance of the Glostavents. To keep records of their use and performance. 2001 - 5 Glostavents delivered to Zambia. Dr Peel gave an intensive training course on the operation, servicing and maintenance of the Glostavent to the clinical officers and technicians. 2002 - 8 Glostavents delivered to Mozambique. Dr Peel repeated the training course. 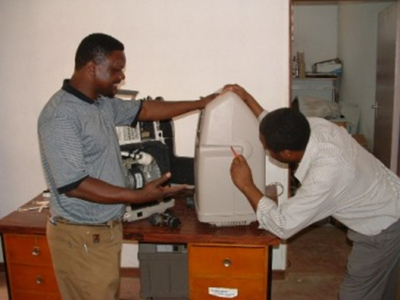 2003- 8 Glostavents delivered to Malawi. This part of the field trial was only made possible due to the support of the Dutch Government. 2004- Dr Peel gave further training courses in Malawi, Mozambique and Zambia (see previous report). 2006- Final inspection of the Glostavents and assessment of the project. During the final inspection visit, Dr Eltringham was accompanied by Mr Richard Tully, Chief Engineer of Diamedica,the company that has taken on responsibility for the future supply of Glostavents and for the training in its servicing and maintenance. To meet the local project co-ordinators to discuss the results of the trial. To visit the hospitals that are using the Glostavents and inspect the condition of the Glostavents. To meet Clinical Officer anaesthetists and discuss their experiences. To meet staff of engineering and maintenance departments. To meet Government officials in respective Health Ministries. The co-ordinators produced records of the use of the Glostavent in the various hospitals in their respective countries. Problems were discussed and recommendations recorded. All 3 co-ordinators emphasised their overall satisfaction with the Glostavents and each of them expressed a wish to have the Glostavent as the standard machine nationally. 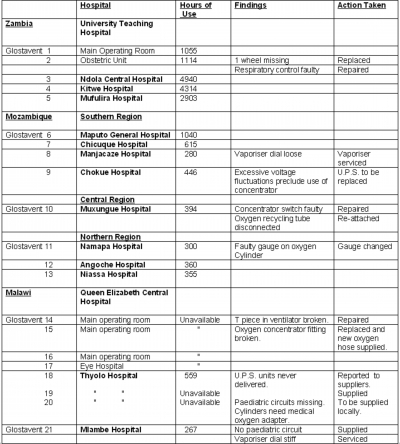 18 of the 21 Glostavents were inspected in their respective hospitals. It was not possible to visit in person the 3 hospitals in the Northern District of Mozambique because of the large distances involved and the transport difficulties. However, a meeting was held with Dr Pedro Utui, the anaesthetist responsible for the Glostavents in this district, and a comprehensive report obtained from this area to complete the inspection. In each hospital, the Glostavents were examined and their function tested in the various modes (e.g. draw-over and continuous flow) and under different conditions (e.g. absence of oxygen, absence of electricity). All were found to be in good working order unless otherwise indicated in the table below. Any faults were corrected by the local technicians working with Mr Tully, so that by the end of the visit all were left fully operational. Clinical officers attended 2 day training courses in the anaesthetic departments of the University Teaching Hospital (Lusaka), Maputo Central Hospital and the Queen Elizabeth Hospital, Blantyre. A series of lectures and tutorials were given in each hospital during which the clinical officers were required to demonstrate their understanding and manual dexterity with the Glostavent during a wide variety of scenarios. They related their experiences with the Glostavents and made suggestions for possible modifications, which have subsequently been passed on to the manufacturers. The basic servicing and maintenance requirements were reviewed, the Glostavents examined, faults identified and repairs effected wherever necessary. In each of the other hospitals using the Glostavents, similar meetings were held with the local staff. All expressed satisfaction with the performance of the Glostavents under their care. Zambia Tsibu Bbuku – Adviser on medical equipment for the Zambian Government. Mozambique Dr Aida Libombo – Deputy Minister of Health. Dr Lina Cunha – Clinical Director, Central Hospital, Maputo. Malawi Dr Wesley Sangala – Principle Secretary of Health Ministry, Chairman of Medical Purchasing Board. Dr Ben Mbwana – Deputy Director, Health Technical Support Services. All had previously been made aware of the success of the Glostavent and had already been approached by the local project co-ordinators and senior anaesthetists in their respective countries with recommendations for the Glostavent. On conclusion of the field trial in 2006, all the objectives of the WFSA/DfID Project No. 1888 were completed, and achieved within the allocated budget (see appendix). The project enabled the performance of the Glostavent to be thoroughly examined under the conditions commonly found in isolated hospitals in some of the poorest countries in the world. Zambia – 5 Glostavents used for 5 years giving a total of 25 years service. Mozambique – 8 Glostavents used for 4 years giving a total of 32 years service. Malawi – 8 Glostavents used for 3 years giving a total of 24 years service. Experience has been gained therefore, during many thousands of hours of use, over 80 ‘Glostavent Years'. The clinical officers kept meticulous records, which were collected and evaluated by the local project co-ordinators in each country. The most popular feature seemed to be its simplicity. It was considered easy to understand and operate. The recommended pre-operative checks took little time and were easy to perform. The Glostavent was used both in draw-over mode and, when required for paediatric patients, in continuous flow mode. The conversion from one mode to the other was straightforward. It was used both as an anaesthetic machine in the operating rooms and as a ventilator in recovery or intensive care units. For example, when three of the four HT-50 ventilators had broken down at the same time in the intensive care unit at the Queen Elizabeth Hospital, Blantyre, Glostavents were transferred from the operating room and used successfully as ventilators for intensive care patients (Anaesthesia News no. 215, June 2005). Halothane was generally used as the volatile agent in all sites. However, when it is necessary to use an alternative volatile agent because of unavailability, this can be readily achieved merely by changing the label on the concentrator dial. A clear advantage of the Oxford Miniature Vaporiser over more sophisticated TEC type vaporisers is therefore that the same vaporiser can be used for whichever volatile agent is available at the time and it is not necessary for a separate vaporiser to be purchased for each individual agent. During the total accumulated service covering more than 80 years, malfunction was rare and of a minor nature which could be readily corrected. Throughout the entire period, the local technicians required outside assistance on only one occasion (see Glostavent no.2). At other times they had the necessary equipment and skill to maintain the Glostavents in good working order without the need for outside help. The time and effort expended in training local staff in the maintenance and servicing of the Glostavent was fully justified. The value of Dr Peel's contribution cannot be overstated. The provision of oxygen cylinders to remote hospitals in sub Saharan Africa is both precarious and expensive, as great distances are involved and roads are sometimes impassable. Large savings were made in all hospitals by using the concentrator on the Glostavent as the prime source of oxygen. The most striking example occurred in the intensive care unit at the Queen Elizabeth Hospital, Blantyre. Before the advent of the Glostavent, the requirement for oxygen was 35 large cylinders per month. Since the advent of the Glostavents this has fallen to an average 10 cylinders per month. At a cost of £25 per cylinder, this represents a massive saving of £625 per month. The alarms on both the ventilator and the oxygen concentrator were judged to be clear and easy to interpret. When the concentrator stopped working, due either to excessive variation in voltage, or complete cessation of the electricity supply (Glostavent no.9, Chokue Hospital, Mozambique), the anaesthetist was able to maintain function without interruption by utilising the reserve oxygen cylinders. A scavenging system to be added to remove exhaled anaesthetic agents. A suction apparatus on each machine. A self-inflating bag near to the patient for assisting respiration. An additional outlet for oxygen for use when resuscitating babies at caesarean section. The disconnect alarm to be made less sensitive. The oxygen concentrator to be quieter. These have been referred to the manufacturers for possible inclusion in later models. The Glostavent was shown to be an effective and reliable anaesthetic machine, enabling anaesthetists to provide a safe and economical service despite the extreme difficulties frequently encountered in the developing world. The hope is expressed that it will make a significant contribution to the provision of safe anaesthesia in disadvantaged areas of the world utilizing locally available resources to eliminate the chronic dependence on outside aid. The contribution of the following to the success of the project is gratefully acknowledged. Thanks are also due to the many individuals who helped collect the data and to the DfID, WFSA and Dutch Government for their support.